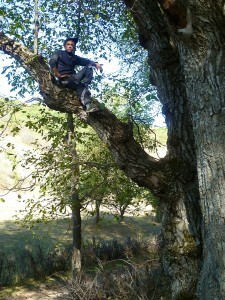 Chris Aslan Alexander goes wild walnut hunting in southwestern Kyrgyzstan. Kyrgyzstan is best known for mountainous yurt homestays and stunning alpine lakes, but I live in the southwest of the country, in a town called Arslanbob, a place nestled into the Ferganah mountain range and beside one of Kyrgyzstan’s best kept secrets: the largest and oldest wild walnut forest in the world. Around the time the first blush of gold begins to tint the woods, Ibrahim, a local German teacher, invites me to join him for a wander in the woods. He’s happy to bunk off school to give me a woodland tour. That’s where we’ll find most of his class and indeed most of the village; everyone is camped there for two weeks of walnut harvesting. Vast in size (27,000 acres), the Kyrgyz woods are alive with bustle and noise. Above us we hear the vigorous shaking of branches followed by the clatter of falling nuts pelting the fallen nuts below, and the occasional squeal when a nut hits a forager. Climbing boys joke with each other above us, women call their daughters in from collecting brushwood and walnuts to come and help prepare a meal. Cows rustle gently as they forage for nuts, or watch with seeming indifference for an opportunity to surreptitiously scoff a nut or two. Having picked the summer meadows bare, they now scavenge through the forest. Walnut harvesting is a community undertaking in the woods outside of Arslanbob. We pass simple bivouacs made of branches and plastic sheeting, often complete with stoves, samovars and grubby seating mattresses, and lose count of the kind offers to drink tea with villagers who clearly don’t have time for a tea-break with harvest in full-swing. Each family is up at dawn and will collect nuts until sunset. Whilst the land belongs to the state, family plots are rented annually. Renters get harvesting, brush-wood collecting, and grazing rights for their patch and over a dollar a kilo for their nuts at market, which significantly swells the family coffers. The trees themselves vary enormously. There are younger trees planted in rows that have grown upright to dizzying heights, but it’s the old trees that I like best. Pot-bellied, gnarled, twisted, bloated, bulbous and scarred, these are trees you suspect of sentience. Turn your back on these trees and they might open an eye or swing a limb, trees straight from Narnia or Middle Earth. I imagine what they might look like in moonlight as I stumble outside for a midnight pee. Ibrahim, looking positively biblical seated on his donkey, explains how God gave the Angel Gabriel a bag of nuts from the Garden of Eden and told him to scatter them from the 4,500-meter mountain peak behind us, forming these wild woods. Alexander the Great, he tells me, made it to the other end of the Ferganah Valley and established an Alexandria in modern-day Tajikistan. Alexander’s armies, scouting for a place for soldiers to convalesce, discovered Arslanbob’s wild walnut woods. They returned home with handfuls of Arslanbob’s nuts, introducing Europe to the walnut, which is still known as “Alexander nut” in some places. 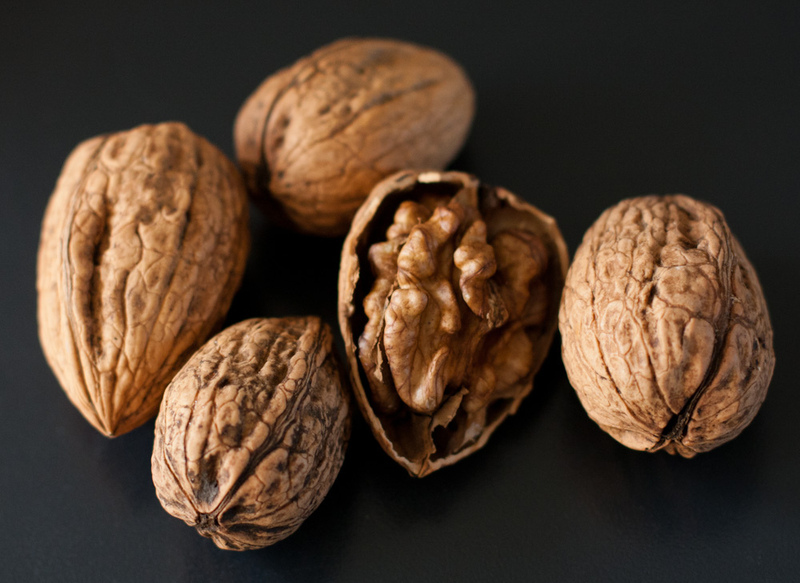 The word “walnut” comes from the old English word for wealth, and some of the passing families have collected at least a bank’s worth. We stop for Ibrahim to half-heartedly castigate some of his truant students before offering to help them with their harvest. Each of them has completely blackened hands and orange cuticles, stained with the juice from the green walnut husks. It’s the same stuff used in self-tanning lotion. Soon our hands are looking brown, although we’d need to work a lot harder to blacken them completely. The nuts are placed in sacks and some sold straight away, whilst others are squirreled away at home to be hand-cracked over winter; whole walnuts without shells fetch a premium. There’s a moratorium on cutting down trees in Kyrgyzstan, an effort to preserve the woods for future generations. Even so, the woods are under enormous stress. Dry leaves are collected for cattle fodder and cows roam freely, destroying new saplings. Ibrahim tells us how during Soviet times the woods were better managed. Foresters confiscated cows found grazing in the woods, often slaughtering them and using the meat for shashlik. Now illegal logging and overgrazing are serious issues. Meanwhile, tourism has helped the village find an alternative source of income. I spend two nights at Ibrahim’s bivouac in the forest, mingling walnut harvesting with bird watching, wandering through these stunning woods, and enjoying unhurried lunches of fresh walnuts, cream, honey, and history lessons from Ibrahim. I need to get back to the village and to the NGO I manage, but most people will be here for a month and some until the first snow. Ibrahim thanks me for helping with the harvest then sends me home, like Alexander’s soldiers, with a bag of walnuts for the road. Chris Alexander is the author of A Carpet Ride to Khiva: Seven Years on the Silk Road.